The ceiling of the Sistine Chapel is one of the most famous frescoes in the world unsurprisingly it's one of Rome's most visited and valued historic sites. Set within the Vatican City and Museums, the Sistine Chapel welcomes around 25,000 visitors a day who flock to see Michelangelo's masterpiece and marvel at the feat of artistry. As cameras are banned it's one to make sure you don't forget! Here are 20 fascinating facts about the Sistine Chapel to peak your interest, test your trivia knowledge and to give you even more reason to go and visit this stunning attraction. The Sistine Chapel takes its name from Pope Sixtus IV, who commissioned the chapel's construction on the foundations of the original Capella Magna in 1477. It was Pope Sixtus IV who invested money into building the chapel and some draw similarities between its new layout and that of the Temple of Solomon described in the Old Testament. Before work started on the ceiling of the Sistine Chapel in 1508, it had been decorated with a fresco of a blue night sky with golden stars, painted by the Umbrian artist Piero Matteo d'Amelia. When Michelangelo was commissioned to paint the ceiling of the Sistine Chapel, he wasn't very pleased, as his main artistic profession was to sculpt. It was with much displeasure that he undertook the role. Michelangelo hated painting the ceiling so much that in 1509 he even wrote a poem lamenting to his friend Giovanni da Pistoia how he'd "grown a goiter from this torture" due to the physical strain of the work. Although many believe Michelangelo painted the ceiling lying on his back, he actually constructed his own scaffolding, so that he could paint standing up for more precision and control. The whole area of the ceiling of the Sistine Chapel measures about 1/6 of a football field - that's around 12,000 square feet. Don't be fooled into thinking the only works of art on show in the Sistine Chapel are those by Michelangelo. You can also see frescoes and works by Domenico Ghirlandaio, Pietro Perugino, Cosimo Roselli and Sandro Botticelli. It took Michelangelo four years to finish the fresco and he left God until last, wanting to have refined his technique enough to depict him perfectly. The God Michelangelo painted as an older man with flowing grey hair inspired centuries of Christian paintings to come, later turning it into the archetypal representation of all Godly figures around the world. 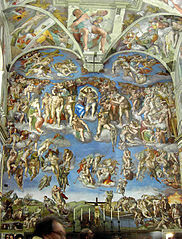 The Last Judgement wasn't actually painted in the same time as the great ceiling fresco. In fact Michelangelo returned twenty-two years later, in 1536, to begin his masterpiece on the wall above the altar. There have been many analyses of The Last Judgement and the allegories and representations within the paintings. Some believe The Creation of Adam draws many parallels to the anatomy of the human brain due to the way it has been painted with the stem, frontal lobe and artery - which is reasonable given Michelangelo's expertise in human anatomy. Although the ceiling and frescoes are near-perfect, there is one tiny part of the sky in the panel depicting Noah's escape which is missing, due to an explosion at a gunpowder depot in 1797 causing the plaster to fall off. It's hard to believe that Michelangelo completed the entire ceiling without being able to review his piece as a whole, since the scaffolding remained in place right until the very end. This means that the first time Michelangelo saw his work, was the time it was unveiled! Among the things that couldn't be misinterpreted were the nudes painted in the frescoes. In 1564, the Council of Trent deemed the images inappropriate and Daniele da Volterra was ordered to cover them up by painting fig leaves, clothing and other items to hide their indecency. The Sistine Chapel is now a historic building of such acclaim that over five million people come to visit a year - that's equal to the population of Norway! Come election time for a new Pope, the College of Cardinals meets at the Sistine Chapel - as they have done since 1492 - to submit their votes under oath. The process is so intense that there's even a room nicknamed the Room of Tears to represent the emotion the lucky chosen candidate will feel after winning the election. If you have exposed shoulders or are wearing items of clothing that ends above the knee, you will be refused entry or asked to cover up within the Sistine Chapel. Visitors to this site should respect the code of conduct and dress appropriately. The most dangerous thing about tourists visiting the Sistine Chapel is the damage not visible to the naked eye. The sweat, carbon dioxide and skin flakes of the thousands of visitors a day pose a threat to the restoration of the masterpiece. The creation of a humidity and temperature control machine is underway.